Home » Longlivemess. Longlivepassion. Longlivecompany. DIM Cinema celebrates the very embodiment of “art in dialogue with cinema”: British filmmaker Derek Jarman, who succumbed to AIDS 25 years ago this month. 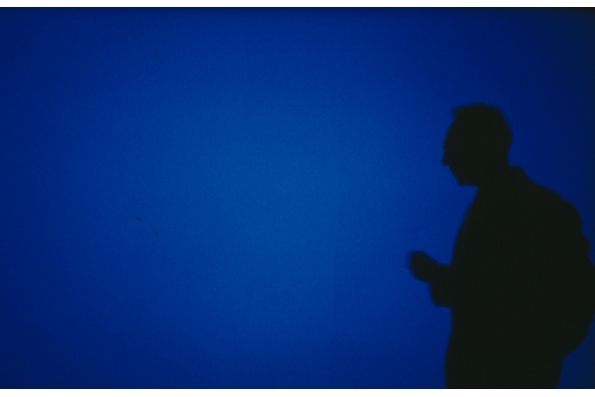 Blue, Jarman’s last work, created as he was losing his sight, is “as bold and daring as anything he ever made, a film made with one block of colour (inspired by Yves Klein’s blue paintings) and music and text from some of his most trusted collaborators, as he explores his own experience of living and dying with the virus (William Fowler, British Film Institute). Glitterbug, completed posthumously by friends from Jarman’s many super-8 films, and scored by Brian Eno, is “a perfect companion piece to Blue [and] a fitting final addition to his eclectic output” (David Rooney, Variety). Our program title (“Longlivemess…”) quotes longtime collaborator and friend Tilda Swinton’s keynote tribute to Jarman at the 2002 Edinburgh International Film Festival.